Spectacular, exotic blooms of white with rose-violet stripes and yellow markings. 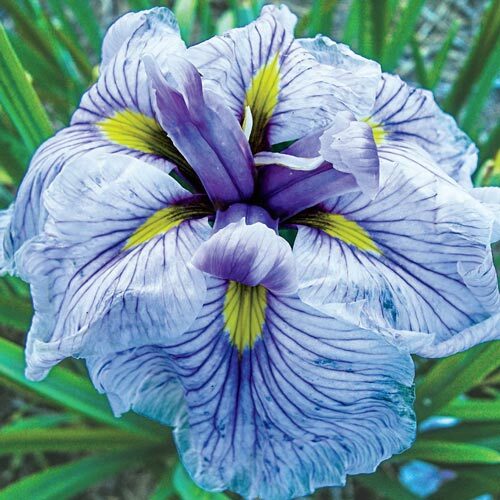 A favorite for planting in rain gardens, around the water's edge and areas that have moist soil, Japanese iris produce colorful flowers with a distinctively flattened appearance. They most often bloom in early to midsummer, after bearded and Siberian iris. Glaucous-green, sword-like fans of stiff upright leaves. Plant with the eyes just below soil and 18-24" apart. Only remove spent flower stems after blooming. Mulch in colder climates +/- 2"